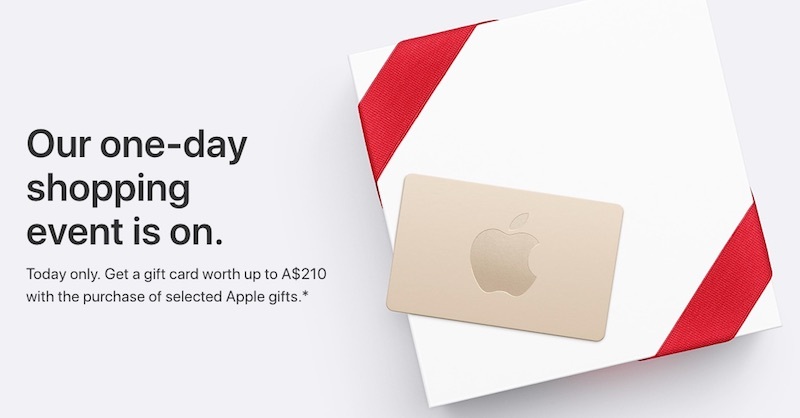 Apple's one-day Black Friday shopping event is now live in Australia and New Zealand, offering customers free Apple Store gift cards worth up to A$210 or NZ$210 with the purchase of selected new Apple products today. The deals are available through Apple's online store, and at Apple retail stores in Australia, through November 24. Apple's terms and conditions state each customer is limited to two gift cards per product category. For the Mac, eligible models include any new 12-inch MacBook, MacBook Air, MacBook Pro, iMac, and Mac Pro, including custom configurations ordered online. Mac mini and refurbished Macs do not qualify. Apple will likely extend its Black Friday event to the United States, Canada, Europe, and select other regions tomorrow. In the U.S., the gift cards could be worth up to around $150 to $160 based on currency exchange rates. Black Friday marks one of the few times in a year that Apple offers deals on its products. Be sure to read our Black Friday roundup for several other deals on Apple products and accessories, and larger discounts in some cases. I'm always tickled when I see "free" associated with gift cards that only come with a required purchase. In this case though, I think it's MR that's at fault. Free shouldn't be in that description. Should just say "offering customers Apple Store gift cards...."
Still, nice discounts nonetheless. Anything to lessen the impact on the wallet is a good thing imo. Amazed to know that just like iPhone X, MacMini is selling so well they don’t want to give people gift cards. With those kind of incentives, why even go to bed tonight. I was hoping something for Apple TV 4K. Maybe "Free of Additional Cost?" But that's straining the message. Because, obviously, without the offer you would normally pay $50 for a $50 gift card. It's an MR style error imo. The gift card isn't free. It isn't even free of additional cost. Think about it. There is one and only one way to get the gift card. To get that A$210 gift card you have to spend upwards of a thousand dollars. So the card literally, figuratively, and contextually can't be free. Unless, as I stated earlier, you're my wife. Then all bets are off. There are hundreds, if not thousands of justifications as to why that gift card is indeed actually free. Straight faced and with no equivocation - she will have reasons. They haven't changed in the 22 years since I said "Well if I have to I guess I have to, so... I do". Yeah, what they're trying to teach in Money and Budgeting classes/courses is that it should be "spent less".